FOUR WINDS is a beautifully renovated West Indian house comprised of three cottages; The Main house, Stone house and Lime house. Situated on Soldier Hill between two of the best beaches on Tortola, Cane Garden and Brewers Bay, FOUR WINDS provides you with the ultimate escape surrounded by lush gardens and breath taking views. The Main House, consists of an outdoor living room, a sky lit kitchen and sitting room, bathroom, outdoor dining room and a master bedroom that opens to it’s own deck. Up some beautiful stone stairs behind the Main House are the Stone House and Lime House. The Stone House and Lime House share an indoor/outdoor bathroom and shower that is nestled between both cottages for easy use. The Stone House consists of a Queen size bed with an outdoor sun terrace while the Lime House consists of a King size bed that can easily be converted into two Twin Sized beds. The beautiful pool, is nestled in the terraced gardens overlooking the South Western shores of Tortola. FOUR WINDS offers both relaxation and adventure and the perfect place from which to explore the secrets of BVI. Further Details: There are really good restaurants, shops, lots of water sports, surfing, sailing, tennis and many wonderful little secrets to discover. Best Kept Secret: Travel on a Wednesday to Wednesday for the best airline prices and you won't lose a full week of work. We sailed into Cane Garden Bay in 1970, and thought we had died and gone to heaven. We dropped anchor, swam ashore and were welcomed into Stanley’s, the only restaurant on the beach, it was set among the palm trees, one even had a tire swing, this gorgeous beach was deserted, and we thought we had found paradise. 30 years passed and we had the opportunity to purchase our dream house that over looks that very first landing. Stanley’s and Cane Garden Bay has grown. The bay is now one of the most fun locations on the island. Alive with pleasures, water sports, sailing, surfing and corn rolls for the kids. At night it lights up with music, dining and dancing. We have had a great 10 years renovating the house keeping the style consistent with West Indian tradition and love of color. We wish we could be there all year round but work calls us back to the states and we love the opportunity to share FOUR WINDS with those that love romance and a taste of traditional Caribbean living. Gardener comes once a week. - Kids must know how to swim. Cell Phone provided for guests. Catering/Chef Available upon request and daily housekeeping upon request. Incredible place and island. Sam was the best host one could hope for. One of the best stays we have had with HomeAway.com. Thank you! Beautiful, comfortable, and that view! We stayed at Four Winds for a family holiday vacation. The house itself was perfect for our group (which consisted of our parents and adult couples). We all had our own space by having the bedrooms in separate houses, but plenty of common areas to hang out and relax. We spent so much time on the porch and by the pool enjoying the view of Cane Garden Bay! 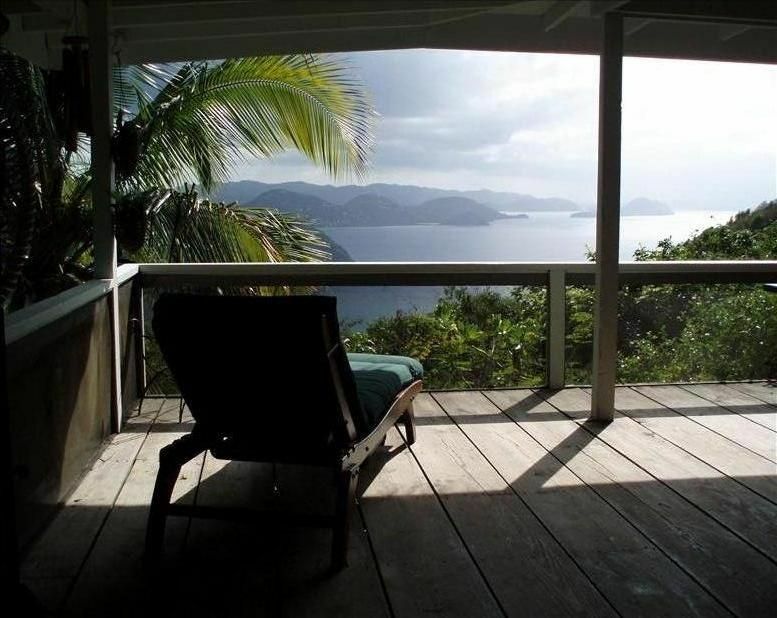 The character of the house is exactly what we wanted when choosing a place on Tortola as well. It has a great island, Caribbean charm that far outweighs any quirks that come with any house on an island. Our favorite thing about this house that surprised us the gardens! The plants were blooming bright beautiful flowers and it felt so lush. We scoped out other houses on the island and none of them had the diversity of the trees and plants that Four Winds did! They've clearly invested effort into this and it elevates the feel of the place x100. In addition, the location is great - 15min drive to Road Town, 5min to the restaurants and bars in Cane Garden, and only a few minutes to Brewers Bay Beach. Plus plenty of other beaches within 20min driving distance. Four Winds made our trip something really special. And Sam and the rest of the crew at Villas of Tortola were so helpful leading up to and during the trip. I definitely recommend staying here and I can say with certainty we WILL BE BACK! What an absolutely beautiful place. The villa was recently renovated in the wake of hurricane irma and they did an outstanding job updating the property while maintaining its historic charm. The dining room and pool have unmatched views. Wildlife everywhere. Really amazing spot. Sam couldn't have been nicer. Wonderful traditional Caribbean home with awesome view down on to Cane Garden Bay. Flexible accommodation, plenty of living and entertaining space. Plunge pool was a real favorite! Amazing views in a tropical private setting. Wish we could stay longer. Waking up to the views of Cane Garden Bay was spectacular!! Lots of outdoor living areas. Can't wait to go back. My husband and I visited in January. We had a tough start as weather conditions were not cooperative, but Sam and her husband did everything they could to help and assist us. The grocery delivery service was a life saver after a very long day of traveling. The views are great, cottages are very private and clean. We love to be out doors and the open air living is so fun compared to New England in the winters. You defiantly need a vehicle to explore the island and once again Sam was on top of helping with this too. It was the highest surf in 9 years while we were there so did not get to go sailing or snorkeling, but perhaps on our next trip. Overlooking Cane Garden Bay and Brewers Bay. Inquire about Honeymoon Packages and Monthly Rates.